The two cheeses are interchangeable in my opinion. The only important thing is how long the cheese is aged. Parmigiano Reggiano is made from raw cow’s milk. The whole milk of the morning milking is mixed with the naturally skimmed milk of the previous evening’s milking resulting in a part skim mixture. The milk is pumped into copper-lined vats (copper heats quickly and cools quickly). There are 1100 L of milk per vat, producing two cheeses each. The curd making up each wheel at this point weighs around 45 kg (100 lb). The remaining whey in the vat was traditionally used to feed the pigs from which Parma hams are produced. The barns for these animals were usually just a few yards away from the cheese production rooms. The cheese is put into a stainless steel round form that is pulled tight with a spring powered buckle so the cheese retains its wheel shape. After a day or two, the buckle is released and a plastic belt imprinted numerous times with the Parmigiano Reggiano name, the plant’s number, and month and year of production is put around the cheese and the metal form is buckled tight again. The imprints take hold on the rind of the cheese in about a day and the wheel is then put into a brine bath to absorb salt for 20 days. After brining, the wheels are then transferred to the aging rooms in the plant for 12 months. Each cheese is placed on wooden shelves that can be 24 cheeses high by 90 cheeses long or about 4,000 total wheels per aisle. 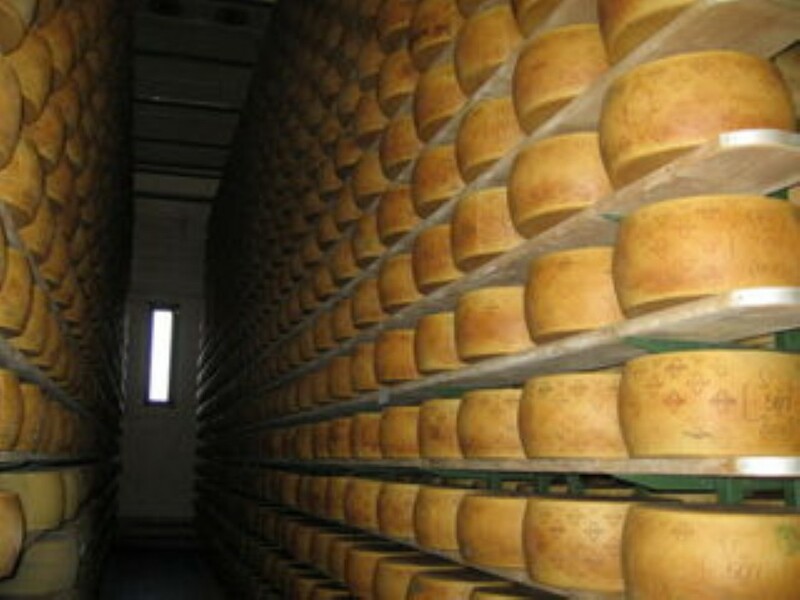 Each cheese and the shelf underneath it is then cleaned robotically every 7 days. The cheese is also turned at this time. At 12 months the Consorzio Parmigiano Reggiano inspects each and every cheese. The cheese is tested by a Master grader whose only instruments are a hammer and sound. By tapping the wheel at various points, he can identify undesirable cracks and voids within the wheel. Those cheeses that pass the test are then heat branded on the rind with the Consorzio’s logo. Cheeses that are not so selected used to have their rinds remarked with lines or the letter x all the way around so consumers know they are not getting top quality Parmigiano Reggiano, but are now simply stripped of all markings. The only additive allowed is salt which the cheese absorbs while being submerged for 20 days in brine tanks saturated to near total salinity with Mediterranean sea salt. The product is aged an average of two years. The cheese is produced daily, and it can show a natural variability. True Parmigiano-Reggiano cheese has a complex fruity/nutty taste and a slightly gritty texture. Inferior versions can impart a bitter taste. The average Parmigiano Reggiano wheel is about 18-24 cm (7 to 9 inches) high, 40-45 cm (16 to 18 inches) in diameter, and weighs an average of 38 kg (80 pounds). Grana Padano cheese is one of the most popular Denominazione di Origine Controllata cheeses of Italy. The name comes from the noun grana (‘grain’), which refers to the distinctively grainy texture of the cheese, and the adjective Padano, which refers to the river Po. Like Parmigiano Reggiano, Grana Padano is a semi-fat hard cheese which is cooked and ripened slowly. It is produced by curdling the milk of grass-fed cows. The cows are milked twice a day, the milk is left to stand, and then partially creamed. I read on another web site that cows for this cheese can be fed silage, which, by definition, can include non-grass feed. This site says grass fed. Which statement is correct and how is the feed monitored, if it is supposed to be grass fed? “Traditionally, cows have to be fed only on grass or hay, producing grass fed milk.” It doesn’t say that cows MUST be grass fed.